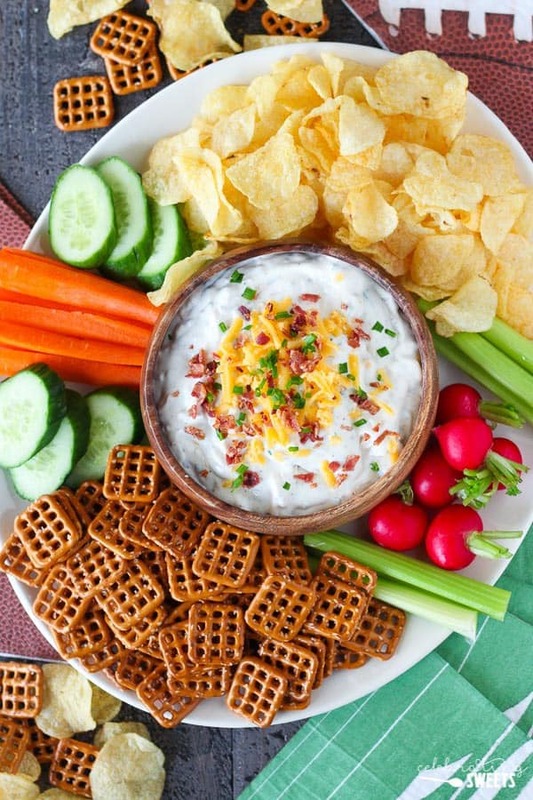 A simple and tasty dip filled with sour cream, cheese, bacon, chives and ranch dressing mix. 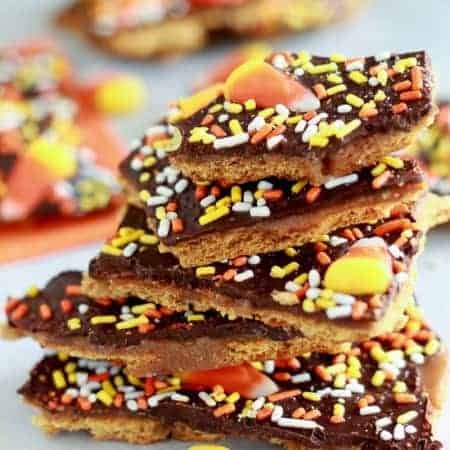 A crowd-pleasing favorite! All those in favor of making dip into its own food group, raise your hand. Since you can’t see me I will tell you that I am raising my hand. Both hands. High. 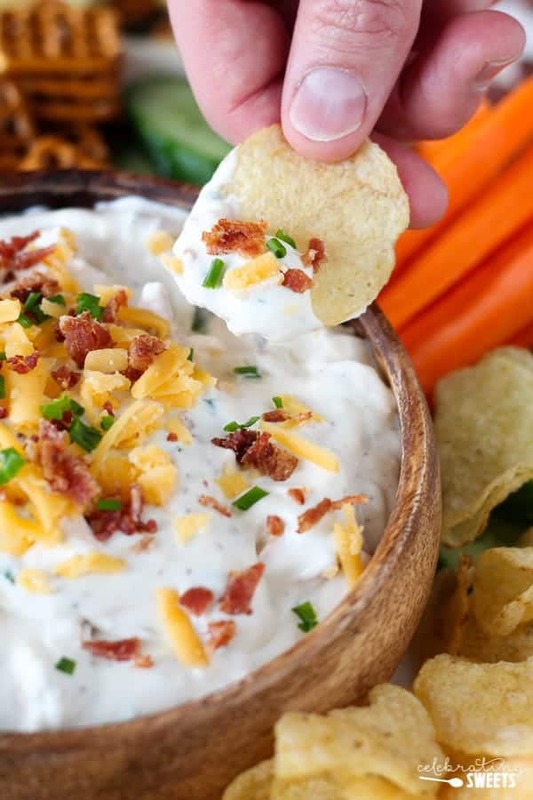 I get giddily excited for football season because football season = dip season. It’s the only time of year that I can justify consuming chips and dip as a meal. And since we’re nearing the end of football season, we’re ending with a bang. Feel free to adjust all the ingredients to suit your tastes (pssst… more cheese and bacon is never a bad idea). Taste it as you go and make it exactly the way you want it. 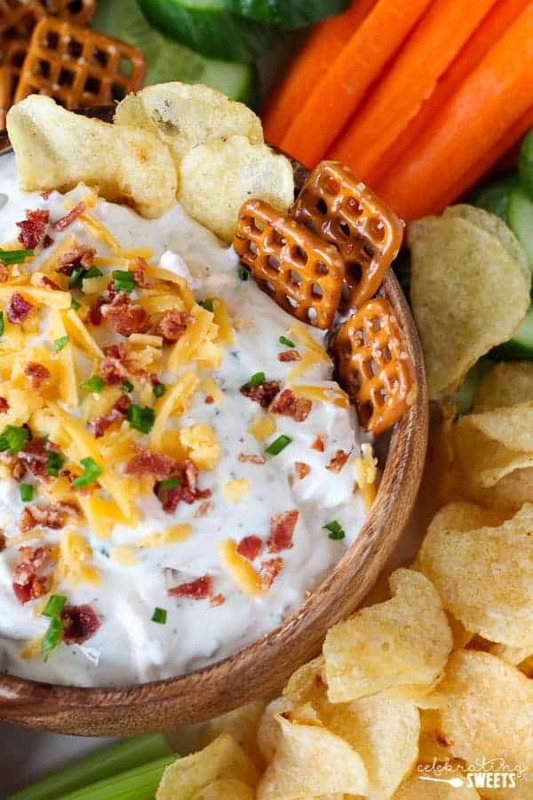 This dip is an absolute crowd pleaser. It’s perfect for all types of parties or celebrations, including upcoming game day parties. 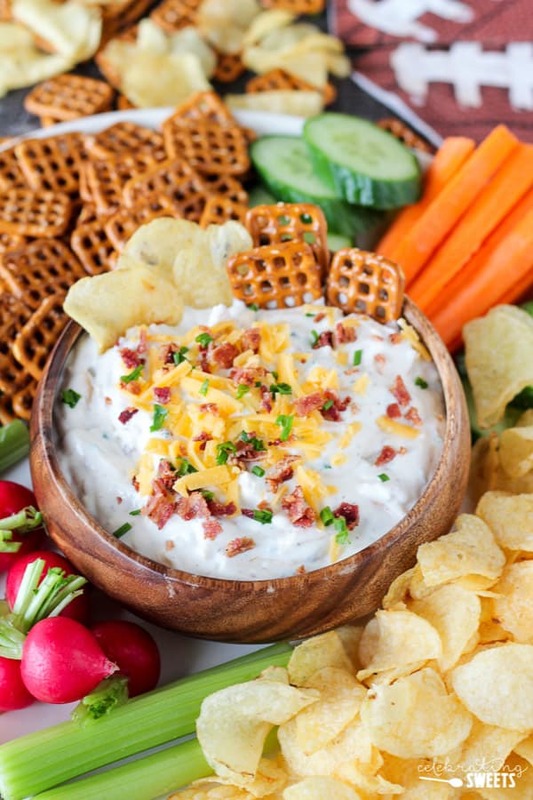 Whether you’re watching the big game with just a few people, or you’re hosting a big party, this dip has to make its way onto your menu. Grab some pretzels, grab some chips – lets’s dive in! 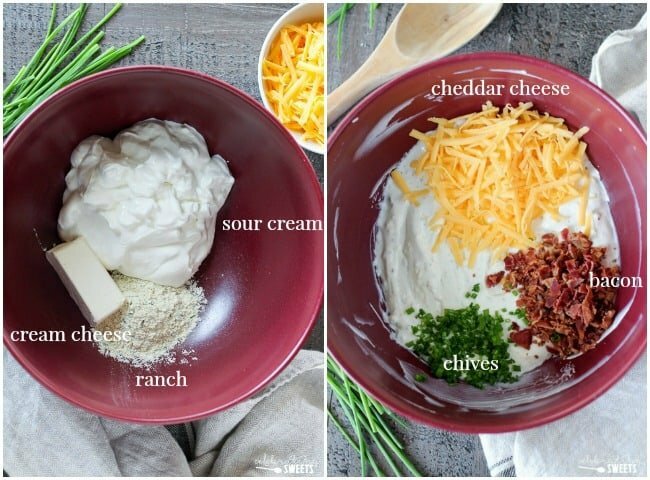 In a large bowl, using a hand mixer or stand mixer, beat cream cheese, sour cream and ranch until creamy and combined. By hand, stir in cheese, bacon and chives. Taste and add salt and pepper if necessary. 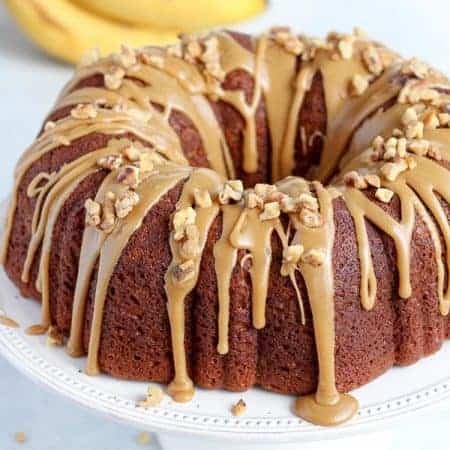 Refrigerate or serve immediately. “All those in favor of making dip into its own food group, raise your hand.” Haha!! Love the way you think! 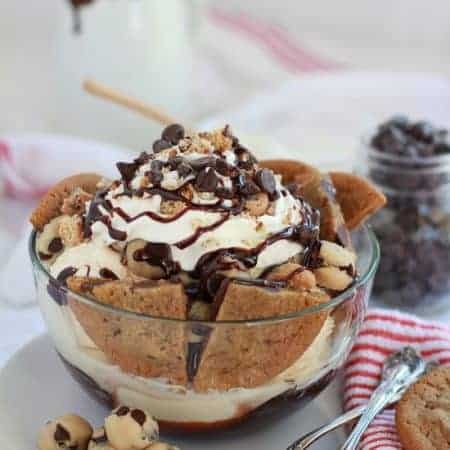 This is such a fantastic idea for a dip! 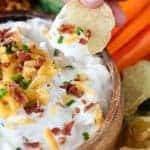 I’ve never heard of a baked potato dip!! THIS sounds awesome! !